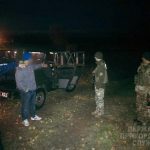 The residents of the village of Shehyni informed the Lviv border guards about the appearance of unknown persons in the border area. The Response Group started immediately to look for the “tourists” 300 meters before the Ukrainian-Polish border. They were the citizens of the Republic of Tajikistan, YOB 1984 and 1985. They had passport documents. The border guards found out that the detainees arrived to Ukraine on the eve by legal way, but they were unable to explain plausibly what they were doing at the Polish border. Subsequently, the men admitted that they had intended to bypass the checkpoint and illegally cross the border. The decision in the case on attempt to cross illegally the state border of Ukraine (committed by a group of persons) will be taken by the court. This entry was posted in Translated Media-News from Ukraine on November 3, 2018 by oksana.